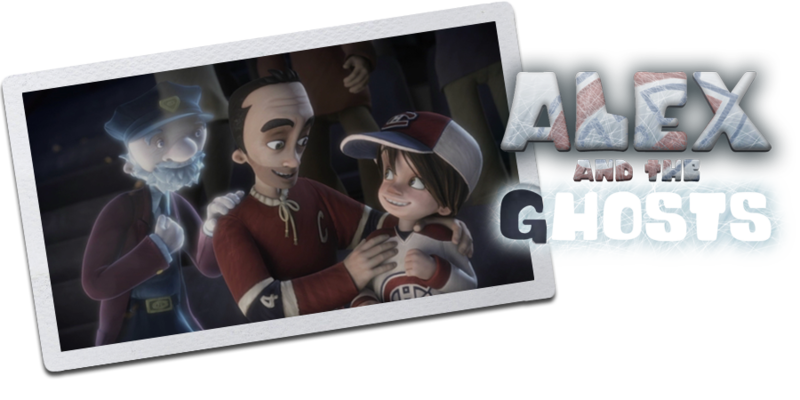 Just in time for the holidays, the ALEX AND THE GHOSTS book and DVD will be for sale at the Bell Centre to raise funds for the Montreal Canadiens Children’s Foundation. The ideal gift to enchant any child while supporting a great cause! Alex on the small screen for the holidays! Alex will be back on TV for Christmas! Don’t miss this opportunity to relive the magic of the Canadiens’ ghosts! ALEX AND THE GHOSTS was just invited to the REELKids Film Festival in Peterborough, Ontario. A nice surprise this week… ALEX AND THE GHOSTS won in the Sports category at the FILMETS Badelona Film Festival in Spain. A special Quebec delegation was the guest of honour at this year’s festival and chose to bring Alex as one of the best Quebec short films of the year. Alex turned out to be so popular that it was also shown in the Children’s and Sports programs! Some last good news before the festival tour for ALEX AND THE GHOSTS comes to an. For more information, please click on our Screenings page. Alex has been touring the planet for two years now and it is unfortunately the time to pack it in… We were lucky enough to enjoy a great tour and we thank all those who helped make Alex such a success! If we get any more invitations that cannot be turned down, we will of course keep everybody posted, and the website will remain active. ALEX AND THE GHOSTS is travelling father and father…! For more information on these festivals, please visit our Screenings page. ALEX AND THE GHOSTS wins its first award in Europe! At the BCN Sports Film Festival in Barcelona for “Best Film for Kids”. ALEX AND THE GHOSTS was selected at the Manhattan Film Festival! ALEX AND THE GHOSTS was selected in competition at the California International Animation Festival! And will be shown on the local channel KAZV TV in front of an audience of 1.5 million! Alex winner at the Canada Film Festival! ALEX AND THE GHOSTS has just received another award! For Best Family Film at the Canada International Film Festival in Vancouver. ALEX AND THE GHOSTS is still collecting selections and invitations throughout the world! - selected for the American Pavilion Emerging Filmmaker Showcase at the Cannes Film Festival, where Alex is finalist for an award! For more details visit our Screenings page. ALEX AND THE GHOSTS was selected for the International Family Film Festival in Hollywood, CA! ALEX AND THE GHOSTS was invited to the San Francisco Bay Area International Children’s Film Festival at WonderCon (www.wondercon.org) in April 2011. Another award to start the year in style! ALEX AND THE GHOSTS won a Golden Pencil Award at the ’2D OR NOT 2D’ Animation Festival in Seattle in the category ‘All-Styles Animation’. What a start to 2011 for ALEX AND THE GHOSTS, selected for 4 more festivals! On top of all this, ALEX AND THE GHOSTS is a finalist in competition at 2 of these festivals, ’2D OR NOT 2D’ Animation Festival and the California Independent Film Festival! Alex will be back in California in January… ALEX AND THE GHOSTS was selected in competition at the Santa Clarita Valley Film Festival. Alex can add a new prize to his collection! ALEX AND THE GHOSTS won Best Animation Film at the Danville International Children’s Film Festival !